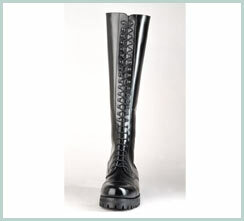 Nick’s Tall Leather Lace Up Boot – Black, brown or burgundy calf leather or Black high shine police grade leather. Fully leather lined. All sole options available, Vibram styles or leather. Elasticized laces. Priced from $750 Cdn. This entry was posted in Police Boots. Bookmark the permalink. Both comments and trackbacks are currently closed.